I’ve been reading lately and see there is a lot of mis information floating around the web on the use of HE VS Regular Laundry Soaps in modern washers. This is the emblem I’m warning you about, this first one on the left. The other 2 are the ones to look for when selecting HE vs regular laundry soap. 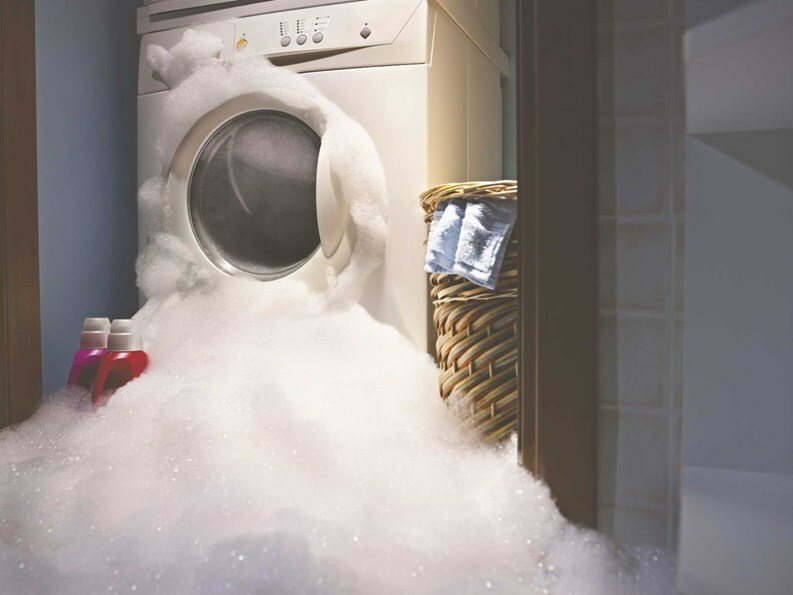 I’ve seen articles stating that the phosphates are the only thing missing from the soaps and they are fine to use to others saying that the only difference is they are less sudsing and the suds can interfere with the movement of the clothing inside of the washer. Then there’s the absolutely incorrect idea that you can use less regular soap as well and it will serve the same purpose. While it is true that they are low sudsing it has more to do with the water tension and the ability of the water to pass through the fabrics to remove the crud. After this crud is removed the detergents job is to suspend said crud in the water to be drained away via the drain pump, in the process not letting them redeposit on the clean clothes. The phosphates have been removed because of algae blooms, nothing to do with the washer. This was more of a problem with dishwasher detergent, not clothes washers. Remember the calls of “My dishwasher doesn’t wash as well as it used to” a few years ago? From my less than basic understanding of chemistry I get that traditional soaps are lye based, where detergents are formulated chemicals. High efficiency is made to be able to suspend dirt, dye, oils and all the gunk in your dirty clothes in low volumes of water where traditional soaps will not. Traditional soaps require a high volume of water to work. These new machines are generally using 12 gallons of water where the old types would be around 56. That’s a pretty big difference. Something that is extremely important in he vs regular laundry soap is selecting your soap is to be 100% sure that it is real high efficiency soap. I’ve been seeing soaps with the he logo on them that in the fine print say “safe for all machines, including he” and I think this is a downright dirty lye. (See what I did there?) Although it may not be lye based it’s still not real high efficiency and a bearing burner. A recent tour of my local walgreens showed me that an estimated 80% of the detergents there were labeled “safe for all machines”. There are a couple of things that are being observed in the field regarding the use of HE vs Regular laundry soaps. We have all seen multiple problems arise from people using standard soap in their high efficiency washers. This is what I’ve noticed. The first and most obvious is how the suds are damaging to the drain pumps. Excessive suds in the drain pump can make it run longer than it needs to run and severely shorten the already short life span that these overpriced Chinese motors are shipped with. The machines can think they still have water in them because the suds interfere with the drain process and can also trigger the water level sensing devises making the pumps run even though the washer has fully drained. This overheats the drain pump and essentially damages it a little every time that happens. Second are the expedited failures of washer bearings, both on the front load models and on the newer top load agitator-less and fake agitator washers. From experience I’ve seen front loads last for 12 years with moderate use using the correct detergents. I’ve also seen front loads last for 5 years with low use using regular soaps. In the short lived cases they were all using regular soaps or the stuff labeled “safe for all machines including he”. Over the last year I’ve seen multiple top load whirlpool built VMW’s and at least one LG with gear cases needing replacement because the bearings have failed. This starts out with a noisy spin and eventually an “out of balance” code. The out of balance will not go away no matter how much redistributing of the load you try to do once it gets bad enough. Some of these were only 2 years old. Slime, sludge, mold and gookus build up is another issue with HE vs regular laundry soap. Although all of these front load washers are prone to having a mold forming around the tub boot, slime will form on the outside of the inner tub and inside of the outer tub using non high efficiency soap. Using too much soap seems to make it worse. This is what causes the washers to smell like a high school football team locker room. It seems that this problem is getting better with the use of the correct detergents and I personally think the detergents have gotten better since inception but you have to use the correct soap and the correct amount. You can use the clean washer cycle with affresh every week but it’s not doing that good of a job anyway. It’s more of a “way to maintain it” feature than a clean the washer once it gets the buildup. Use the correct detergent for your machine. It will smell better, work better, and last longer with less problems than it will if you use the wrong stuff. I’m recommending Tide HE or Woolite for the time being, that may change but for now that’s the word. In HE machines use 2 TBSP of detergent. I know it hardly seems like anything but that’s what the washer manufacturers are recommending and I’m sticking with what they say versus taking a soap salesman’s recommendation.